In an attempt to leverage it’s Facebook presence the Office 2010 team is asking users to submit their names to create custom dictionary for Office 2010. 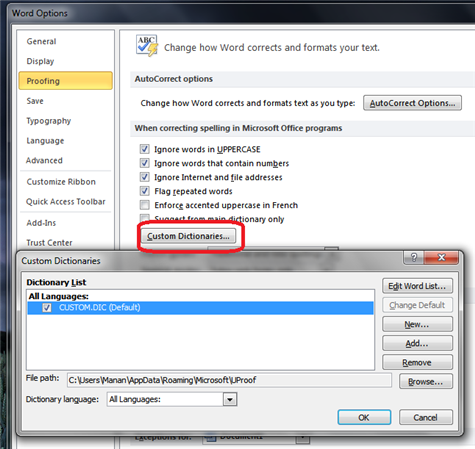 Microsoft Office spell-checker, though awesome shows many names as wrongly spelt words. The official Microsoft Office Facebook account has released a Facebook application wherein you can submit your name to be added to a custom dictionary. Having names with the red line is quite irritating and while one can add words manually, collating names via social media platforms such s Facebook (and perhaps even Twitter) is a brilliant idea. All you have to do is visit the application page, allow it to publish information on your wall so that your friends come to know about the campaign and you’re done. PS: Probably one of the most useful Facebook application I’ve come across lately.